If one looks at the last 50 million years of our region's geological history and projects this period onto the span of one year, then the last 100 years of lignite mining and the resulting transformation of the landscape have only lasted 63 seconds. In a German-Polish cooperation project, pupils in close collaboration with musicians, composers, and geologists have composed the one-year piece of music geo-sounds in which this process is transformed into sound. What does coal sound like? You can find them in the environs of Leipzig, in the Lausitz region as well as in large parts of Silesia: huge pits where man has wrested coal from nature. In the area around Leipzig, it has taken 50 million years, and in the Lausitz region and Silesia, 25 million years, for plant residues to turn into the lignite that we use for heating or electricity generation. 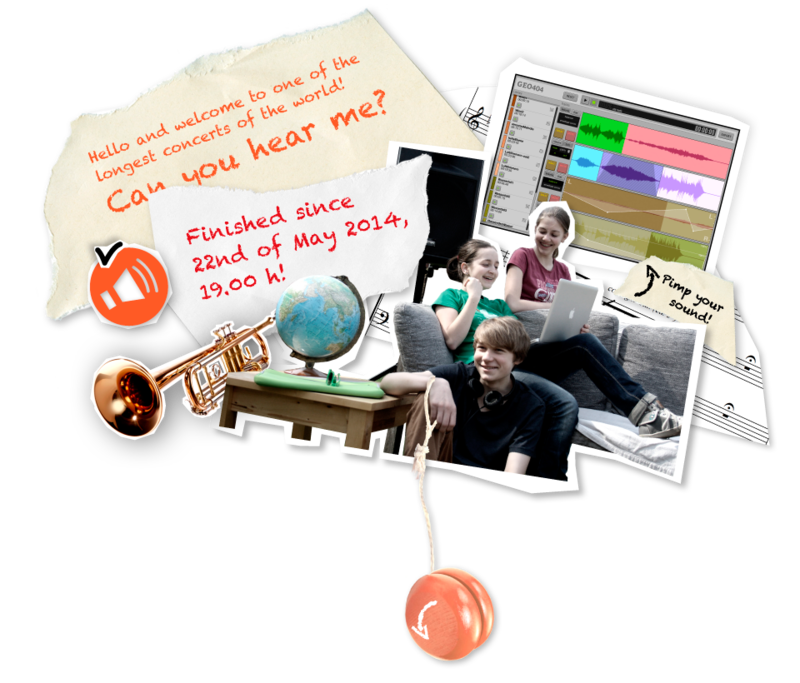 The next two changes of sound will take place on 22 May at 4.00 and 6.57 p.m. Within a very short period of time, they will make audible the beginning of the interglacial warm period and the mining of the coal. The third and last of the altogether 17 changes of sound of the internet composition takes place at 7.00 p.m., when it reaches the present day. At the same time, it not only marks the finale of one of the longest concerts of the world but also announces the future. The first change of sound lasts one hour. Then, the warm period and river motifs can be heard simultaneously. The second change of sound will only last one minute, bringing the motifs of the interglacial warm period to the fore. The third change of sound concludes the internet concert and transitions into the live performance of the world première of geo-sounds future. 15th Change of Sound, 22 May, 4.00 p.m. The current warm period, the so-called Holocene, began some 10.000 years ago. The forests have returned, landscapes are dominated by slowly meandering rivers as well as numerous lakes, ponds and a wide variety of wildlife. Over the millennia (Paleolithic, Neolithic, Bronze and Iron Age), man gradually evolves into the modern homo sapiens. Flint tools, hunting grounds and worked bones are his first evidence as hunter and collector. When man settled down, he increasingly created rituals and cultures and discovered more and more natural raw materials for use in everyday life. 16th Change of Sound, 22 May, 6.57 p.m. The age of coal mining begins in the 17th and 18th centuries. Wood is replaced by fossils as the main fuel source. In central Germany, the earliest surface mining of coal can be dated back to 1671. Later, coal is mined deeper into ground. The first small-scale opencast mines are operated at the beginning of the 19th century. The development of the steam engine and the onset of industrialisation around 1830 result in increasing energy consumption and industrial extraction of raw materials. With the advent of large-scale opencast mines in the 20th century, man has irrevocably become a geological factor. Reckless intrusion, exploitation and regulation are until today the consequences for nature and the environment, but also for man and his villages. 17th Change of Sound, 22 May, 7 p.m.
We have reached the present day. In Germany, many large-scale opencast mines have disappeared, and the water level in the huge holes in the earth has risen. Man wants to design new cultural landscapes in harmony with nature. In the former coalfield areas in central Germany, both the lakes and the nature and technology monuments integrated into them testify to the history of landscape and climate. In Poland and other parts of Germany, large-scale lignite mining with all its consequences is still a very topical issue. However, the climate change remains a global message for the future, even though the energy turnaround is well underway: man must change his mind and bethink himself. We therefore invite you to participate in the German and Polish première of „geo-sounds future“, which takes place on 22 May, at 6.30 p.m., in Dresden and on 24 May, at 7.00 p.m. in Krakow. There, the young composers and artists will present their visions of what life will look like in 25 years. Further information about the concerts is available under „Project“!